This was our second trip to Ennerdale water in the lake district. The first time was a huge success so I hoped this trip would live up to expectations. Along with me was my bro in law Sam, and my ever faithful dog Bruno armed with his new backpack. We arrived at Ennerdale water at 3 in the afternoon with the aim of walking as far into the Ennerdale valley as we could get as it would shave some mileage off our hike the next day. This would enable us to spend as much time in the mountains hitting as many peaks as we could. After about an hour of walking disaster struck! Bruno managed to shake off his backpack somewhere in the forest or water. This doesnt sound too big a deal, but we were miles away from any resupply and were planning on being so for 2 days. Remember that old saying about eggs in one basket?...I ignored that old wisdom to my detriment. The bag had all of Brunos food a and comfort items for the trip. He hadnt eaten anything all day so without the pack he was going to have an uncomfortable night. WE HAD TO FIND IT. We searched high and low along the path, in the forest, the water runaways, and the bushes and after 3 hours or so I was starting to get pretty stressed. We made the decision to set up camp roughly where I thought it was lost to have some dinner and relax for a bit. I remembered that the bag had reflective piping on it which I was hoping would stand out well under torch light. My Hammock- best way to sleep in the woods. After we got some food down us and sat down for a bit it quickly got to 10 o clock and it was still not dark enough, but we went on the search anyway. I had a small bag of beef jerky that I ended up feeding the completly unaware Bruno, this turned out to just be a bonus for him- as we were walking along, Sam caught the reflection of the pack from his head torch and saved the day. The trip had finally begun. Triumphant as we found the dog backpack. Although we didnt set up camp in a place of our choice, we got lucky with the location as it turned out we had a stunning view between the trees of the mountain we were going to climb the next day- Pillar. View of Pillar Rock through the trees. A homemade bed for Bru made out of bracken. We had no plans of making a fire, but due to the ridiculous amounts of midgies swarming us it was the only thing we could do to smoke them away. We let the fire burn out and retired for the night knowing we had added about 3 miles to our intended walk. Cheers Bruno. After a late start and a hearty breakfast we broke camp, tidied up and headed off on the long walk up the up the valley to begin our ascent on Pillar. Looking down at Ennerdale Valley and the Black sail lodge is barely visible. All of the stresses from the night before disapeared as we saw the veiws ahead. On the other side of the river was one man and his Collie that we later met as we were going up the hill. It turned out his wife had left her phone up the mountain somewhere the day before, and he had the unfortunate job of trying to locate it. 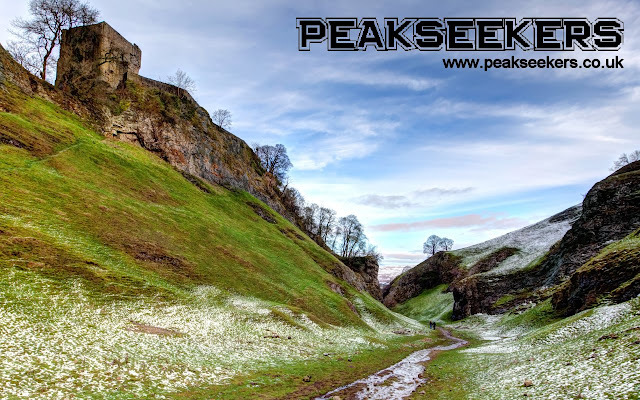 He was lucky enough to find the phone and we were glad to have him come along with us for a chunk of the walk which worked out well for us as he had some great local knowledge to share including a better and quicker route towards pillar off the beaten track. With two days of equipment and supplies in out packs we were starting to slow the man and his dog down, so he headed on ahead of us. If you are reading this Stuart, thanks for the help, the route worked out great! A nice little tarn, no name at this time. Bru showed a lot of heart throughout the climb. A very, very, tired dog. After the long walk and being treated to some of the best views the lake district has to offer, we reached the top which was covered in hill fog. Touching the trig point still gives me an amazing sense of satisfaction. Summit reached, Bru shakes in celebration. I think Bruno was just happy it was nearly over, little did he realise just how much further we had to go to get back to camp. After a quick stop to navigate ourselves down the hill, we picked our path and stuck to it. Some thick hill fog, but no rain. Bruno was starting to get very tired, so we were having regular pit stops on the way down and took his pack off him periodically. A brief pause while Bruno takes in the veiw. On the descent down the hill we remembered an old portacabin that was in the middle of Ennerdale Forest. It was a long walk away but we weighed it up against seting up camp and getting attacked by mosquitos all night and thought it was well worth the trek. Not our normal camp, but good nonetheless. On the walk back to the car in the morning we passed a waterfall we saw on our first trip. A great end to a great couple of days. I love this place. I'm looking forward to my upcoming wild camp in the lake district with my dog. Any followers of my blog will have seen him with me on a couple of my camps, but this will be a little different from the norm. I have to really make sure I plan well for this trip as we will be far away from shops and shelter. I am going with my brother in law Sam. We are planning to hammock on this trip. We always take the same method of shelter whether it be tents, tarps n bivis, or in this case hammocks as it means we are both looking for the same kind of pitch. The very nature of the lakes makes it difficult to find flat ground especially in the forest areas so a hammock should give us an easy time finding a pitch anywhere with trees. Its always a good idea to be in a bivi bag as a last defense- it also adds another season to your sleeping bags warmth. I'll be taking my bivi for all these reasons aswell as to have for an extra sleeping method if we find better spot out in the open. Para cord and whistle wrist band. Washkit bag which holds my toothbrush, paste, and deodrant aswell as most of my accessories shown in the pic. Homemade ration packs, 1 for each day. Its a lot of food, but I'm a big lad with a big appetite! Things not shown; Waterproofs trousers and jacket. Small UCO candle lantern- just for comfort in the evening, and the citronella keeps the mozzies away. As you can see from the pic above, I am pushing the boudaries of my Karrimore Sabre 45 a bit, but once the food goes down, it will all carry a lot better. Before I go I will cover my bivi bag with a rubble sack to keep the rain out. 100g Pasta (cook seperatly and add to the pouch to bulk out the meal and boost the carb content for the next days walk). The black leather boots shown above on the right are my Altberg Mountain boots. They have been very tough to wear in and I have had some epic blisters from using them, but I am not about to give up on them yet as they really come into there own once you get off the paths. From recent walks I realised that I need some more comfortable summer boots that are a bit lighter and a lot more breathable. I like the look of these Merrell Chameleon Mid Evo boots, and they come highly reccomended by my brother in law. I'll be taking both sets of boots with me and deciding on which to use when I see the weather, obviously I know this can change in an instant! This is a follow up from my owners earlier post on the broken cheapo backpack. The seller was kind enough to offer him an instant refund, so the cheapskate decided to do what he should have done in the first place- bought me a quality pack. 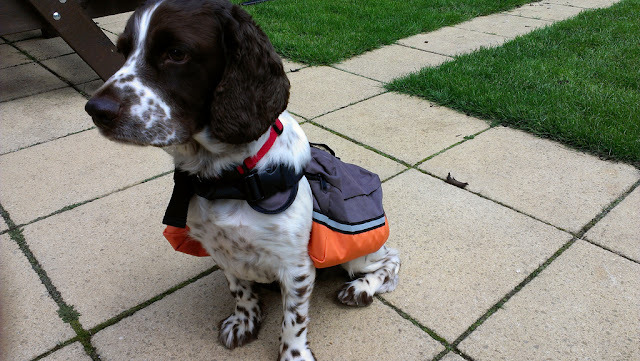 This is my review of the Ezy Dog backpack. When the pack arrived I was instantly impressed with the quality. Its materials are what you would expect to see on a high quality human backpack. Ripstop nylon, waterproof zips, and lightweight mesh padding. All the hardware such as buckles, and trident clips are also top notch. Upon trying it on all my concerns of backpacks from the last purchase disapeared. This pack is comfortable. It sits above the legs instead of the middle of the back which allows me to move freely. There are no straps that dangle around my, well... danglies. ...the straps on my last pack got a fresh spray of irn bru every time I cocked my leg. So what do you put in a dog backpack? Water bowl, Rubble sack (multi purpose, rubbish bag), waterproof and insulated coat for the cold night (I'll be under my owners tarpaulin), 3mtr length of para cord (leash for night time), tick tool, flannel (to dry off with at the end of the day), loads of bags (for some reason my owner likes to carry my $h*t??!! ), a couple of rawhide chew bars, a tin of sardines for each day, and a good sized tub of dog buiscuits to nibble on throughout the day. So far I am happy with my Ezy Dog backpack. It has good load carrying capability, is comfortable and stable on the back, and built in a manner that suggests it will last a lot of abuse. the main thing I like about it is that it gives me indipendence- so my owner doesnt get all my gear dirty. The real test of this pack will come when I go for my upcoming trip to the lake district shortly, I'll update this post when I get back. ....now, I'm off to go and lick my berries and wake up the neighbours. You b*tches keep the bed warm for me. Me and Bruno went for a walk around Grafham Water today to test out his new backpack seen below. He is coming wild camping with me to the lake district in a few weeks so I needed to check he was comfortable with it for a good distance. Grafham water is about a 10 mile radius going through forests, grassland, and standing crop fields. The aim of his backpack was to enable him to carry his own food, a bit of water, and a little bedding. Long story short about the dog backpack... it failed miserably. 1 strap broke, and the pack has a 3 inch tear at the seams- what did I expect for £12 off ebay? Avoid ...but it was a great excuse for a days walking so I can't complain. Brunos 6th sense kicked in as we approached the resevoir and he started to stir knowing we were soon to be walking. His head popped out of the window and I had to be mindful not to brake too hard! From the approach the water looked really choppy. There was an incredibly strong wind and a forecast of showers so I packed a rain jacket expecting the worse. It turned out to be a beautiful day with stunning views. The wind was blowing hard, but the sun kept in as t shirt weather the whole way round.